Epic beef burgers stuffed with caramelized onions and topped with more onions and plenty of cheese. 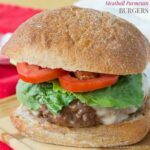 French Onion Soup au Gratin Stuffed Burgers take the classic hamburger and turn it into something extra special. 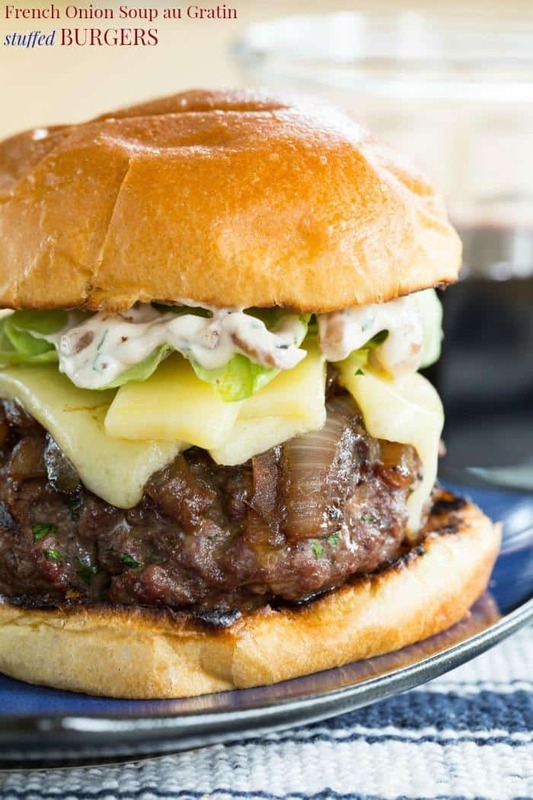 Take the classic caramelized onions and gooey cheese to stuff and top your burgers, then grill these epic stuffed burgers. There are so many food holidays out there. Each day has one, if not more ingredients, dishes, or cuisines that are honored and celebrated. Everything from liver and onions to peanut butter gets its day in the spotlight (though let’s be real, I am more likely to join in celebrating the latter). And then let’s talk about the months. Oatmeal Month. Noodle Month. Cookie Month. Yes, there’s even a Gazpacho Aficionados Month. Personally, I think it’s all a bit too much. But there is one month I can get behind – Burger Month. Yes, you guys, perfectly coinciding with the unofficial kickoff to grilling season, May is National Hamburger Month. 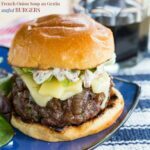 And who better to celebrate with than my friend Kita of Girl Carnivore and all of our blogging buddies with over 100 BRAND SPANKING NEW BURGER RECIPES! Every new burger recipe will be added to the Burger Month website throughout May, and you can check out the #burgermonth hashtag all over social media. 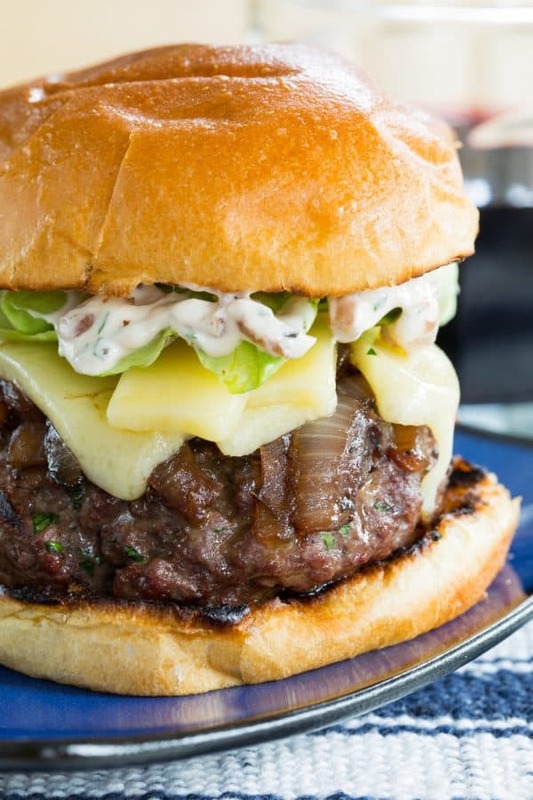 Burger Month calls for an epic burger, and these French Onion Soup au Gratin Stuffed Burgers fit the bill! When thinking about a knock-your-socks-off burger for Burger Month, I went back to a tried and true comfort food – French Onion Soup. Soup as we kick off summer? Yes, because when you take the elements of this classic soup – caramelized onions, beefy broth, and melty cheese – and stuff it inside and on top of beef, it’s an absolute winning formula. I mean, French Onion Soup au Gratin Stuffed Meatloaf and French Onion Soup au Gratin Stuffed Meatballs have been total hits. 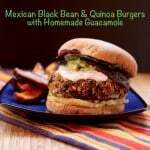 Bringing this savory deliciousness to a hamburger seemed the obvious next step. So I did exactly what I did for those recipes and made a pan full of caramelized onions, added some beef broth for that soupy rich flavor, and reduced it down to concentrate all of that deliciousness. This got stuffed inside some basic beef burgers, more was piled on top, and then those babies were tossed on the grill. Gruyere cheese and a toasted brioche roll added the touch of toasted bread and melty cheese that defines the classic crock of French onion soup. And for a little extra punch of oniony goodness, a simple aioli-type spread was made with even more of those caramelized onions mixed in. If that’s not a burger of insane proportions, I don’t know what is! 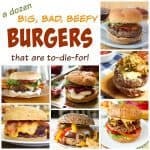 And if that’s not enough, how about even more burger deliciousness in these recipe collections! First you’ll find A Dozen Big Bad Beefy Burgers for tasty takes on the classic beef hamburger. 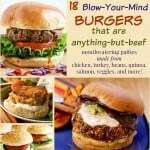 But if you prefer turkey, chicken, seafood, or veggie burgers, here are 18 Blow-Your-Mind Burgers that are Anything-But-Beef. In a small bowl, combine all of the ingredients and stir to combine. Store in the refrigerator until ready to use. In a bowl, combine the beef, parsley, pepper, and salt, and gently combine with your hands. Divide the meat mixture into four equal pieces. Take one piece of the meat mixture and flatten into a very thin patty. 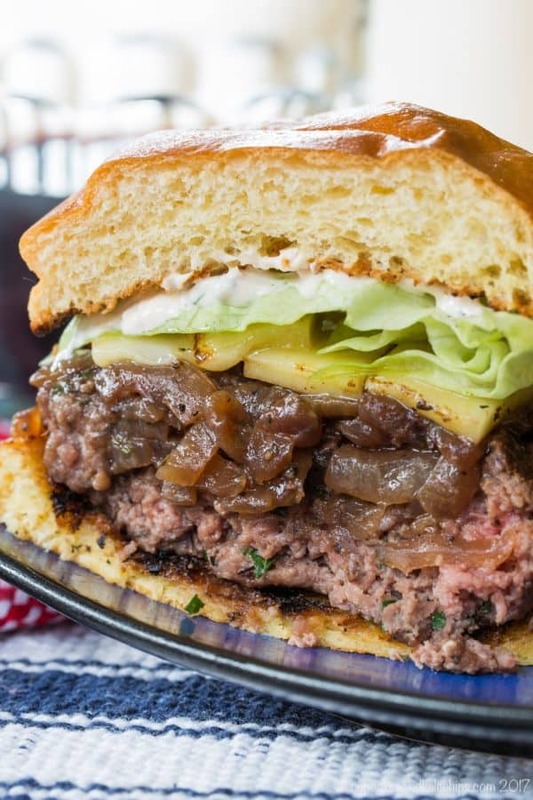 Place about a tablespoon of the onions in the center of the patty and wrap the meat around the onions to form a burger, sealing as best you can. Repeat with the remaining three pieces of meat. Preheat your grill to medium-high heat. Grill for 5-6 minutes per side to desired doneness. 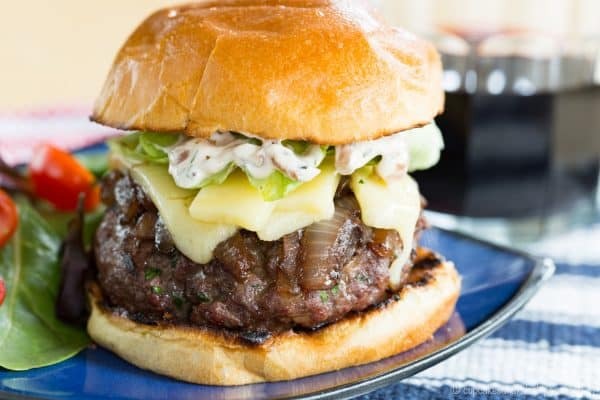 For the last couple minutes of grilling, divide the remaining onion mixture on top of the burgers and top each with a quarter of the Gruyere cheese. Lightly toast the buns on the grill. Place one burger on the bottom half of each bun, top with lettuce and French onion spread. 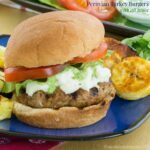 Recipe nutrition based on serving burgers on brioche buns. This looks like a PERFECT burger! Love the flavors, and looks so juicy! All in for the caramelized onion and gooey cheese! Have mercy, woman! These turned out phenomenally! Wow, this is one great burger! I have totally fallen in love with it – I’m a bit of a burger fan, but well, who ain’t? Great recipe, I need to try it. I love burgers but I have not tried a handful of varieties. Good to know that there are so many variants of burger for the burger lovers. 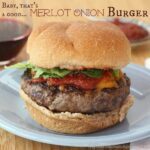 Onion burger is something I am thinking of trying since long, but not the beef. Well, the recipe is a bit complicated for me.So, I will pass it on to my wife.